The gig economy - what is it? The gig economy really came about at the start of the most recent recession so the term is not new. We have heard about it a lot recently with the Deliveroo and Uber cases where contractors under these models have sought employment rights. So what exactly is it and is it here to stay? The gig economy has always been around but really came to the fore when workers were laid off during the recession or were having difficulty finding employment. It's an extremely flexible working model that is generally digitally enabled. People compete for short term work or 'gigs' or place their services or products on a digital market place that means that they can dip in and out as and when they want to. Examples of the gig economy include Etsy, AirBnB, Uber, Deliveroo. It is a completely different model to that of the standard job where you have a fixed wage and agree to work a certain number of hours for that wage with the relevant employment rights and benefits that come with being an employee. The gig economy can operate in a number of different ways and generally offers complete flexibility to gig economy workers through digital platforms. It is the question of employment rights that has brought the gig economy to the attention of the media recently. In the UK Uber are appealing a ruling that drivers were ‘workers’ and so entitled to holiday pay and minimum wage. Judgments in similar cases brought by cycle couriers in the UK are expected shortly. A UK union that has applied for recognition by Deliveroo will also have its case decided shortly. 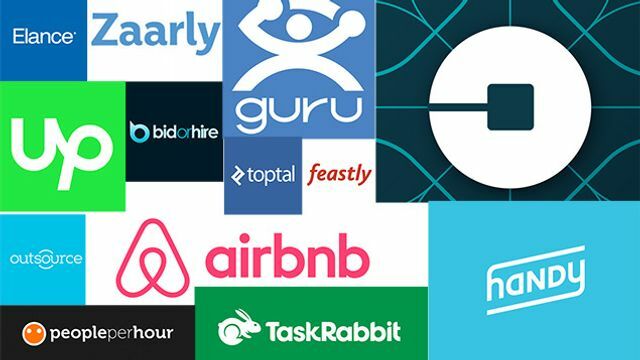 The decisions in these cases could seriously hamper the progress of the gig economy if the service providers are deemed to be workers/employees. The main argument in the Uber cases is based around control and whether the drivers are truly freelance. They cannot set their own fares and they cannot directly contact passengers. Not very much control at all really. So is it here to stay? Yes I think it is but from an employment law perspective it will not be workable for all services and products. There will always need to be trial and error in that regard. Self employed contractors have no employment law rights and it is low paid workers that really need the benefit of employment law rights. In my view to be truly self employed you must be able to exercise a great deal of control over the work and fee. If that is not really happening then you are more akin to an employee and should not be exploited. What we may need is a middle ground - employment law that recognises that people may genuinely want to sacrifice employment law rights for significant employment flexibility and employers should not be penalised for facilitating that where the model is not exploitative. However those persons should have a high level of control in respect of what they are doing and what they are charging. A mixed model for some services could also work - the service providers is paid a flat basic fee for being available but can earn more for taking on more work. The Economist recently found that there is no official evidence to demonstrate that the gig economy is actually changing the way most people work. The share of workers with permanent jobs in both America and Britain has not really changed much in recent years. Multiple job holding has not increased either. Ultimately I anticipate workers in the future will try different ways of working across their lifetimes depending on their industry, age, stage and personal circumstances. What is certain is that the 'job for life' is long gone. Long live choice! Uber, Airbnb and other major players are going to continue to grow and become more powerful. On one hand, this is good for drivers and residence owners because with ubiquity will come more demand to use those idle assets. On the other hand, as the power becomes concentrated with one player per vertical, expect to see the payouts shrink on a transactional basis, as these now large companies seek ways to increase their margins without putting off user growth. Expect to see a move towards small businesses being a focus of new gig economy service offerings. Expect to see an enormous push towards hyperlocal offline needs, a continuation of what Uber started, but using smaller and smaller assets.